The Level by FluidStance is truly a category-defining product. With its fluid 360-degree motion, stylish deck, eco-friendly high-quality design, and a bunch of certifications, (including Mayo Clinic’s NEAT certification), it neatly beats out most would-be competitors. It is definitely worth the price if you appreciate aesthetic appeal, good quality, and believe caring for the environment is a good cause. A lifetime guarantee against manufacturing defects. 26.5" x 12.2" x 2.5"
Fluid 360-degree motion. Stylish design, high-quality, environmentally-friendly product. Natural range of motion for the ankles (like walking). Increases energy expenditure by almost 20%. High cost. Wood polish may be too slippery while wearing socks. Less challenging to balance than other boards. FluidStance The Level is the coolest-looking balance board you’ll ever own. It’ll look just as stylish leaned against the wall as resting under your feet. Functionally, it will keep your ankles in a natural range of motion and still allow you to spend around 20% more energy than sitting. It can accommodate tall and short users and will last a lifetime (with an option to replace the deck). Standing desks have been around for years—some say since the 1400s—and have the likes of Thomas Jefferson, Ernest Hemingway, and Winston Churchill to claim as prominent advocates. Used alone, however, they do not make for ergonomically-sound workstations. For that, you’ll need a few essential accessories like a monitor arm, a laptop stand, and ideally a keyboard tray. And you can’t get away with standing on a hardwood floor—or even carpet—for long. Normally, we’d recommend a quality anti-fatigue mat to keep your feet comfortable (and we still do), but in today’s day in age, you are presented with a lot more choice when it comes to cushioning your stance, ranging from active mats to treadmills and office balance boards in between. The FluidStance Level is a balance board that first captured the hearts and minds (or rather eyes) of standing desk users back in 2015 when it raised half a million dollars (805% funded) via crowdsourcing platform Indiegogo. 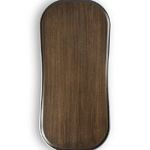 Today, it is leading the market of office balance boards along with the brand’s other decks, all of which feature a similar shape and stylish design in a range of colors and finishes. FluidStance founder Joel Heath, who has experienced the difficulties of standing firsthand after transitioning from a traditional desk to a standing one, notes that our bodies were made to move during the day—and whether we’re standing or sitting, we’re still not moving. Using his experience at the helm of Teva footwear, he came up with the idea of a naturally rotating underfoot platform that would inject some physical activity into day-to-day desking. To achieve this, Heath gathered a team of engineers and built more than 20 prototypes to test the ideal shape and range of motion of his future balance board. Among the challenges they overcame was figuring out the weight capacity. From the production side, it was finding a manufacturer in the United States who would agree to begin with smaller scale production. Independent biomechanics facility, Heeluxe Lab, identified the board’s range of motion (ROM) at 23.98 degrees (±4.65), which is around our bodies’ walking ROM of 21.25 degrees (±5.67) and around normal dorsiflexion (toes above heels) ROM of 0 to 20 degrees and plantar flexion (toes below heels) ROM of 0 to 50 degrees (the average passive ankle ROM is 18.9 degrees ±5.9). For all users (healthy or otherwise), it means that while using The Level their ankles will not move outside the normal walking range of motion, keeping them in a neutral, strain-free position. 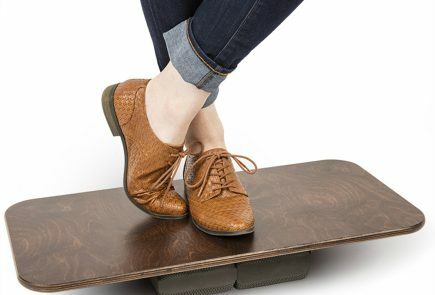 Also tested at the Mayo Clinic lab and awarded NEAT certification (the first balance board to get one), The Level was found to cause no significant difference in the number of typing errors, even while increasing the heart rate by 15% and raising energy expenditure by 19.2% compared to sitting. We got our FluidStance decks within less than a week of them shipping. They came in a slim box with two polystyrene foam holders on each side, complete with technical documentation and a warning sticker that says: “Use at your own risk”. The construction quality of The Level is hard to beat. Its .190" die-cast aluminum walls support up to 250 lbs while bamboo or maple decks feature GREENGUARD-certified finish (meaning it is low-emission). The base powder-coating is almost zero-emissions compared to painting and anodizing. When it comes to user experience, FluidStance is everything it promises to be, which certainly justifies the price for many reviewers. FluidStance’s own survey shows 95% customer satisfaction with the product, while the independent reviewers note a couple slight drawbacks like the slippery top deck surface (problematic only if you’re wearing socks) and an easily scratchable base (do not use on uneven floors with crumbs and debris). We found the medium-sized deck fit taller individuals well, but if you are under 5’10, the smaller, more affordable FluidStance deck—The Plane—will also be a viable option. As for the weight capacity, The Level supports under 250 pounds, so heavier individuals will have to fork out additional 100-200 dollars for FluidStance’s Original balance board with a weight limit up to 300 lbs, (which looks completely identical to The Level in bamboo, but you get to choose from a number of colorful aluminum bases). Unlike other balance boards out there, The Level found the perfect middle ground between difficulty and ease—it’s not too challenging but also not plain boring. We can confirm the many user reviews that say the board’s learning curve is quite short. Once you hop on, it instantly earns the Fluidstance name. Unlike simpler boards, it pivots 360 degrees, allowing for complete freedom of motion. We did find the board performed best on carpeted flooring because on hard surfaces like concrete, you’ll be able to feel every bump and irregularity from the floor. The board’s special feature is the replaceable deck that can be removed by unscrewing the four screws at its base (next to the rubber stoppers). Joel Heath notes that since the product was built to last, it can be passed through the generations and become a modern family heirloom. And, we might add, if one deck becomes unfashionable for a time, you can always substitute for a deck with a more modern flair. This makes for a recyclable product, too. If you’re like us, standing deskers who spend at least half the day on our feet, the issue of the hard deck surface is the most pressing. It’s tough on the heels and doesn’t allow for prolonged use. FluidStance offers colorful fitted 0.5” thick UPmats made of PlusFoam that go perfectly well with any of their decks (except The Plane). We do recommend buying one for your balance board if you don’t want to constantly lift your regular anti-fatigue mat and slide it on top of your board. This one should cushion your soles and heels pretty well, although we do not know exactly how the PlusFoam stacks up against 100% polyurethane (aside from the fact that it is also fully recyclable). It will also help extend the time of use and protect the glossy wood finish from dirt and scratching. By the way, FluidStance is the only balance board brand that supports their product with an entire line of accessories like mats, holsters (for a single board), racks (for office fleets), thin board-shaped flooring mats to protect both the base and your floors from scratching, and an all-purpose cleaner. Aside from committing to design health products with environmentally-friendly production methods, FluidStance partnered with the non-profit First Descents, an organization that provides free outdoor adventure experiences for young adults fighting cancer; they commit one percent of equity, one percent of top line sales, and one percent of employees’ time to the group on an annual basis. 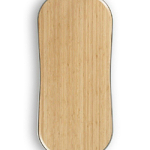 If you have the cash to spend, The Level is a perfect balance board for the average consumer. It allows complete freedom of movement without placing too much pressure on your calves and ankles, all while encouraging subtle exercise as your body re-adjusts to retain your balance. Environmentally-friendly, high-quality production will ensure the board lasts years into the future. And the aesthetically appealing design will definitely make it the coolest attraction in your cubicle or home office. 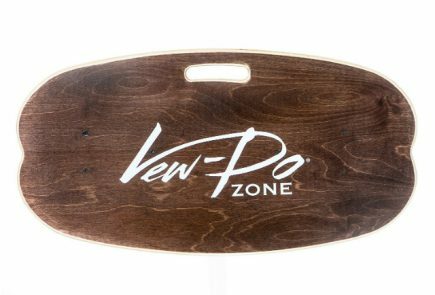 If the downside of the slippery surfaces can be managed with some padding, the high price is going to be the only major factor that might direct your choice away from The Level, perhaps towards its competitors like IndoBoard or Pono Board. Want to see how The Level stacks up against the competition? 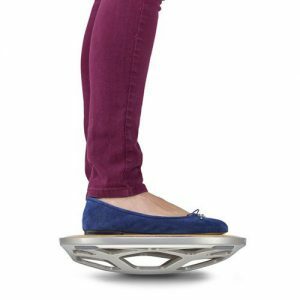 Check out our round-up of Balance Board Reviews. Also, explore the closely related categories Standing Desk Mats and Non-Flat Standing Mats. Board size is 26.5" long x 12.2" wide x 2.5" tall. Its approximate weight - 7lbs (12oz). Designed for use under 250 pounds. If you're buying directly from the FluidStance website, boards ship the next business day unless noted otherwise. Standard shipping via FedEx Ground on all domestic orders with 3-5 day delivery. USPS shipping to Alaska and Hawaii. On offer FedEx 2-Day Shipping and FedEx Standard Overnight Shipping for domestic orders. .190″ walls of its die-cast aluminum frame are finished with powder-coating, which has almost zero-emissions. A rounded base acts as a pivot point for the board.